Please note the following are tentative and may be changed or revised at any time without notice. Check with the UC San Diego Department offering the course for the most accurate information. Students are encouraged to complete the lower and upper division core courses early in their program, as these courses will provide a foundation to enhance subsequent course work. Global Health majors should complete the upper division core courses, GLBH 181, GLBH 148 and if possible, MGT 173 prior to senior year. Students with lower division standing who would like to take an upper division course, please submit a course pre-authorization request here. When searching for classes in the schedule, look for your classes by "CODE".If you look at the first search page of the schedule, "By Code(s)" is the third tab under "find courses." Select this tab.In this section, you can then just type in the exact courses you are interested in searching for (ANSC 148, HILD 30, ANSC 101) and press search. On the next page, scroll down and a long list of all the courses you’re searching for will appear in one search. If you are taking a course that is offered “by petition” it will not automatically show up your degree audit. "Please accept _____________, a Global Health Pre-Approved Course, towards _______________ requirements for my Global Health ___________ (Major/Minor)." Introduction to global health from the perspective of medical anthropology on disease and illness, cultural conceptions of health, doctor-patient interaction, illness experience, medical science and technology, mental health, infectious disease, and health-care inequalities by ethnicity, gender, and socioeconomic status. This course will provide an overview of global health as a field of research and practice, with an emphasis on use of surveillance methods to understand health and determinants of health, evidence-based program development and evaluation of programs in the field, and engagement with governments and advocacy groups to elicit evidence-based policy change. Topics of focus will prioritize infectious diseases, maternal child health, substance use and gender-based violence, as case examples of global health research and programmatic approaches. By the end of this course students should have acquired an understanding of the global burden of major diseases and population health concerns, how to understand and intervene upon the determinants of disease and other health concerns, and how to develop and implement monitoring and outcome evaluations for use in low resource settings. This course covers efficient techniques for managing health services projects including both the technical aspects of project management as well as the human capital management issues associated with blending administrative and technical staff with healthcare professionals. Topics include: scheduling methods, milestone setting, governmental regulations, resource allocation, interpersonal skills, and performing research and development projects - all with a health services focus. HILD 30. History of Public Health: Explores the history of public health, from the plague hospitals of Renaissance Italy to the current and future prospects for global health initiatives, emphasizing the complex biological, cultural, and social dimensions of health, sickness, and medicine across time and space. GLBH 20. Introduction to Global Health: Provides a foundational interdisciplinary understanding of complex global health issues and introduces major concepts and principles in global health. The course surveys the range of problems contributing to the global burden of disease and disability including infectious disease, mental illness, refugee and immigrant health, natural disasters, climate change, and food insecurity. SOCI 30. Science, Technology, and Society: A series of case studies of the relations between society and modern science, technology, and medicine. Global warming, reproductive medicine, AIDS, and other topical cases prompt students to view science-society interactions as problematic and complex. SOCI 40. Sociology of Health-Care Issues: Designed as a broad introduction to medicine as a social institution and its relationship to other institutions as well as its relation to society. It will make use of both micro and macro sociological work in this area and introduce students to sociological perspectives of contemporary health-care issues. SOCI 70. General Sociology for Premedical Students: This introductory course is specifically designed for premedical students and will provide them with a broad introduction to sociological concepts and research, particularly as applied to medicine. PHIL 26. Science, Society, and Values: An exploration of the interaction between scientific theory and practice on the one hand, and society and values on the other. Topics can include the relationship between science and religion, global climate change, DNA, medicine, and ethics. PSYCH 60. Introduction to Statistics: This course provides an introduction to both descriptive and inferential statistics, core tools in the process of scientific discovery and the interpretation of research. Recommended to complete during a student's 2nd year. POLI 30. Political Inquiry: Introduction to the logic of inference in social science and to quantitative analysis in political science and public policy including research design, data collection, data description and computer graphics, and the logic of statistical inference (including linear regression). Poli Sci 30 is Lecture only, and Poli Sci 30D is Lecture plus Discussion section. These courses are equivalents of each other in regards to major requirements, and students may not receive credit for both 30 and 30D. MATH 11/11L. Calculus-Based Introductory Probability and Statistic + Lab: Events and probabilities, conditional probability, Bayes’ formula. Discrete random variables: mean, variance; binomial, Poisson distributions. Continuous random variables: densities, mean, variance; normal, uniform, exponential distributions, central limit theorem. Sample statistics, confidence intervals, hypothesis testing, regression. Applications. Intended for biology and social science majors. Prerequisites: AP Calculus BC score of 3, 4, or 5, or Math 10B or Math 20B, and concurrent enrollment in Math 11L. COGS 14B. Introduction to Statistical Analysis: Introduction to descriptive and inferential statistics. Tables, graphs, measures of central tendency and variability. Distributions, Z-scores, correlation, regression. Probability, sampling, logic of inferential statistics, hypothesis testing, decision theory. T-test, one and two-way Anova, nonparametric tests (Chi-square). Prerequisites: COGS 14A. GLBH 160. Global Health Policy: Students will learn fundamental principles and concepts of global health policy, law, and governance. The course will focus on identifying critical global health policy challenges and solving them using a multidisciplinary approach that takes into account the perspectives of various stakeholders. POLI 170A. Introductory Statistics for Political Science and Public Policy: Introduction to the use of statistics in both political science and public policy concentrating on regression based approaches. Students undertake a series of small quantitative analyses and one project. Prerequisites: upper-division standing. USP 147. Case Studies in Health Care Programs/Poor and Underserved Populations: The purpose of this course is to identify the special health needs of low income and underserved populations and to review their status of care, factors influencing the incidence of disease and health problems, and political and legislative measures related to access and the provision of care. Selected current programs and policies that address the health care needs of selected underserved populations such as working poor, inner city populations, recent immigrants, and persons with severe disabling mental illnesses will be studied. Offered in alternate years. Prerequisite: upper-division standing or consent of instructor. USP 171. Sustainable Development: Sustainable development is a concept invoked by an increasingly wide range of scholars, activists, and organizations dedicated to promoting environmentally sound approaches to economic development. This course critically examines the diverse, often contradictory, interests in sustainability. It provides a transdisciplinary overview of emergent theories and practices. Prerequisites: upper-division standing. SOCI 152/USP 133. Social Inequality and Public Policy: (Same as USP 133.) Primary focus on understanding and analyzing poverty and public policy. Analysis of how current debates and public policy initiatives mesh with alternative social scientific explorations of poverty. Prerequisites: upper-division standing. Will not receive credit for SOCI 152 and SOCC 152. ECON 130. Public Policy: (pre-reqs: ECON 1A-B. or ECON 2. or ECON 100A) Course uses basic microeconomic tools to discuss a wide variety of public issues, including the war on drugs, global warming, natural resources, health care and safety regulation. Appropriate for majors who have not completed Econ 100A-B-C and students from other departments. Prerequisites: Econ 2 or 100A. HISC 180. Science and Public Policy: This course will explore the evolution of the institutions, ideologies, procedures, standards, and expertise that modern democratic societies have used in applying science to generate and legitimate public policy. ENVR 110. Environmental Law: Explores environmental policy in the United States and the ways in which it is reflected in law. The social and political issues addressed include environmental justice and environmental racism, as well as the role of government in implementing environmental law. Prerequisites:upper-division standing or consent of instructor. 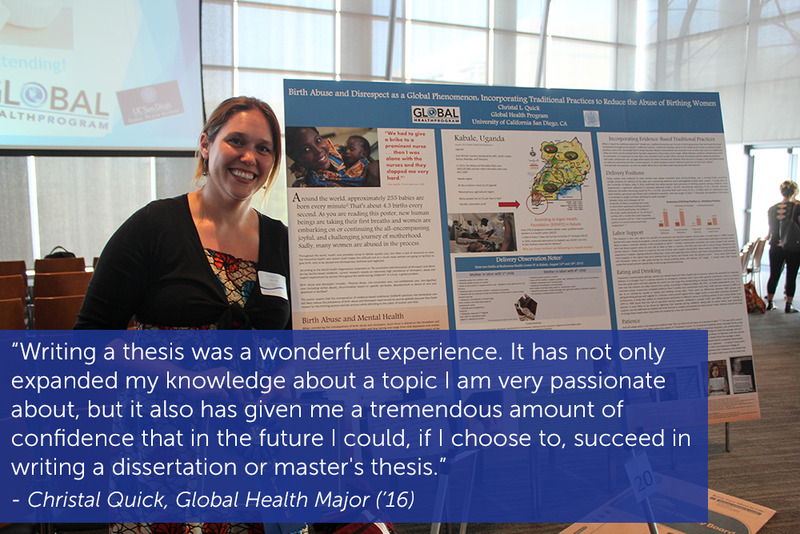 During senior year, graduating students will participate in a two-quarter seminar open only to Global Health majors. This seminar will provide an opportunity to expand, deepen, and share the insights of your Global Health Field Experience or a topic of interest in the field of global health, with members of your cohort. GLBH 150A will consist of intensive reading and discussion in fields related to each student’s primary interest and building on your field experience. GLBH 150B will be a workshop with critical input from all participants focused on preparing a senior thesis that will provide an important credential for students in the next stage of their careers and as they prepare applications for graduate academic or professional training. Students will develop a research poster based on their senior thesis, which will be presented at the Horizons of Global Health Conference during spring quarter. See part participant abstracts here. See Senior Thesis Resources here. ***Students must complete their Global Health Field Experience Requirement prior to enrollment. This course gives students experience in teaching global health courses for academic credit (P/NP). Students, under direction of instructor, lead discussion sections, attend lectures, review course readings, and meet regularly to prepare course materials and to evaluate examinations and papers. This course does not fulfill any Global Health major or minor requirements. Students may enroll up to two times. Minimum of a 3.0 GPA. Must have taken the course and received an "A" in the course you wish to apply for. Student most contact the instructor to see if the instructor is interested in having an instructional apprentice. If the instructor approves, you may apply online. Once you apply please email ghpadvising@ucsd. to notify us of your application. Final approval required by department and academic senate. Please submit your request early (prior to the quarter you plan to enroll). More details on enrolling can be found here. GLBH 197. Global Health Academic Internship Program (4): Offers Global Health students the opportunity to intern and gain credit for their Global Health Field Experience requirement. Students will intern and work with a faculty advisor to elaborate on the intellectual analysis and critique of the field experience. GLBH 198. Directed Group Study (4): Directed group study for students to delve deeper into Global Health topics or elaborate the intellectual analysis and critique of their field experience for students enrolled in the Global Health major/minor. May be taken for credit two times. Prerequisites: departmental approval required. GLBH 199. Independent Study (4): Independent study opportunity for students to work with Global Health Affiliated Faculty on relevant research or to elaborate the intellectual analysis and critique of their Global Health Field Experience for students enrolled in the Global Health major/minor. May be taken for credit two times. Prerequisites: departmental approval required.